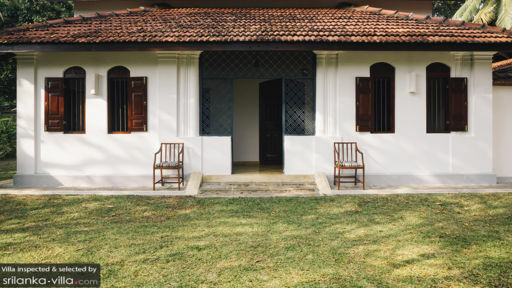 A traditional Sri Lankan home only 10 minutes away from the historical city of Galle, Kalahe House is a lesson in Sri Lankan hospitality, tradition, and heritage. Featuring whitewashed walls, antique wooden doors, and a red shingled roof, the home is a comfortable vacation spot for guests searching for serenity and peace. With Unawatuna beach only a short distance away, the picturesque landscape allows you to observe panoramic views of rice fields in all their scenic beauty. Manicured gardens, three bedrooms, and spacious living and dining spaces make up this gorgeous home away from home. 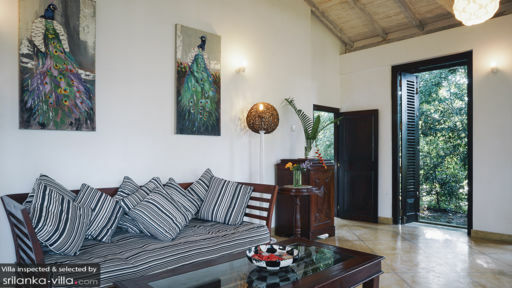 After a long day at the beach or exploring Galle city, head back to the comfort of Kalahe House where three, well-furnished and air-conditioned bedrooms are all set up for you. Two bedrooms are furnished with four-poster king-sized beds, while the third has four-poster single beds. The mosquito nets ensure you get a good night’s sleep without any disturbance. The bedrooms feature an old-world charm so intrinsic to a Sri Lankan home to make it easy for you to settle in your new surroundings. Each bedroom comes with an en-suite bathroom equipped with necessary amenities. 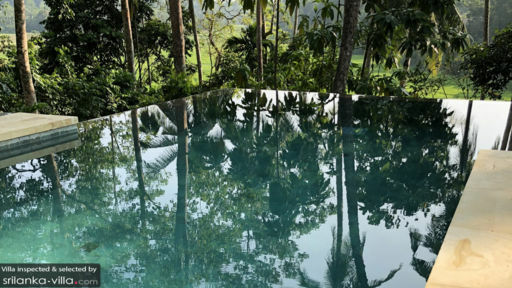 A stunning 9-metre swimming pool accentuates the natural beauty of the outdoors at Kalahe House as it sports an infinity edge that overlooks rolling green paddy fields as far as the eye can see. The beautiful and luscious gardens have been kept well pruned and proper so you can walk along the grass, enjoy morning yoga and meditation, and even soak up some sun while lounging on the outdoor chairs, sun loungers beside the pool, and others. Towering palm trees cast their shade on the ground so find your spot and indulge in an afternoon nap. The sublime décor of the comfortable living area at Kalahe House is enhanced due to its understated colour scheme, minimal furnishings, and vibrant artwork. The traditional ceiling and antique wooden furniture truly brings out the opulence of this space and stunning lush garden views add to its charm. Comfortable sofas and chairs allow you to relax and spend endless hours simply enjoying the calm of the surrounding areas. There is a study as well so you can catch up on some work, write letters, etc. Alongside dark-wood slatted doors that allow abundant natural light indoors, there stands a circular dining table with seating for six people. Enjoy a delicious meal made from locally sourced ingredients and fresh vegetables. The chef will be happy to take requests and the meals are made available at cost while a breakfast is included in your stay. While the villa is a haven for travellers, the services it offers is the icing on the cake. There is the Kalahe House Spa where guests can get spa treatments and massages for the utmost relaxation. The villa manager will happily arrange for tuk-tuks to take you to Galle, only a short ride from the property. Everything from housekeeping to maintenance is well looked after. The villa is equipped with free wi-fi as well. Only a few minutes from Galle, Kalahe House is truly an idyllic holiday home since you can bask in the quiet surroundings or when you wish to turn to civilisation, you can visit the historical city of Galle with Galle Fort – a UNESCO World Heritage Site. There is Dutch architecture to witness in the city and lots of local shops and restaurants to explore.